On Tuesday, Senate Republicans voted to begin debate on health care in a 51-50 vote with the goal of repealing and replacing Obamacare. Sen. John McCain (R., Ariz.) returned from surgery to cast his "yes" vote and Vice President Mike Pence cast the tie-breaking vote. Two Republican senators, Susan Collins (R., Maine) and Lisa Murkowski (R., Alaska), voted against the motion to proceed. Earlier today, President Trump warned that the vote today was a signal to Americans that they were serious about action. "Any senator who votes against starting debate is telling America that you are fine with the Obamacare nightmare," Trump said. 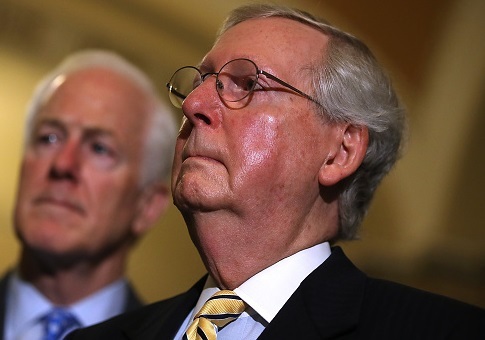 "For Senate Republicans, this is their chance to keep their promise. Over and over again they said ‘repeal and replace, repeal and replace.' There's been enough talk and no action. Now is the time for action." Sally Pipes, president and CEO of the Pacific Research Institute, says the Senate will now debate various replacement plans, but she is not confident any of them can pass. Pipes said Republicans have been promising repeal and replace for years now and need to keep their promise to the American people. "I don’t really know what all this means for the full repeal and replacement of Obamacare," Pipes said. "The Republicans have been promising repeal and replacement for seven years, four months, and two days." "And when you look at what's about to happen—McConnell will put out the American Health Care Act and then they will pull that out and put the Obamacare Repeal Reconciliation Act—I don't think that can pass because people like Rand Paul want repeal and replace, and it's really just repealing a few parts of Obamacare, then waiting for two years for a replacement." Pipes says if the House replacement does not pass, the Senate will look next to the Better Care Reconciliation Act with both the Cruz and Portman amendments. She says that if this comes up for a vote it will need 60 votes, which will likely not be possible. Pipes was also critical of the Senate's idea for a skinny repeal bill, which would repeal the individual and employer mandate and the medical device tax. "What does this really mean for repeal and replacement of Obamacare?" Pipes said. "As I see it now, I think Obamacare will continue, and it will be Obamacare lite." "The longer the time goes on the more difficult it's going to be, and we're seeing tremendous media coverage on single payer on the federal level and in the states," she said. Pipes also warned that Republicans may reach out to Democrats to work on a replacement. "What Democrats would actually be willing to provide support for a real repeal and replacement?" she asked. "I just don't see how they could get any bipartisan support for a real repeal and replacement plan." "For seven years, four months, and two days, the Republicans have been campaigning on repeal and replace Obamacare," Pipes said. "Look at the mess we're in right now. At the ballot box in 2018 several of these Republican senators who are up for reelection think that if they don’t continue the Medicaid expansion forever, and more money and three years isn’t long enough—they could lose because they didn’t do what the electorate asked them to do."